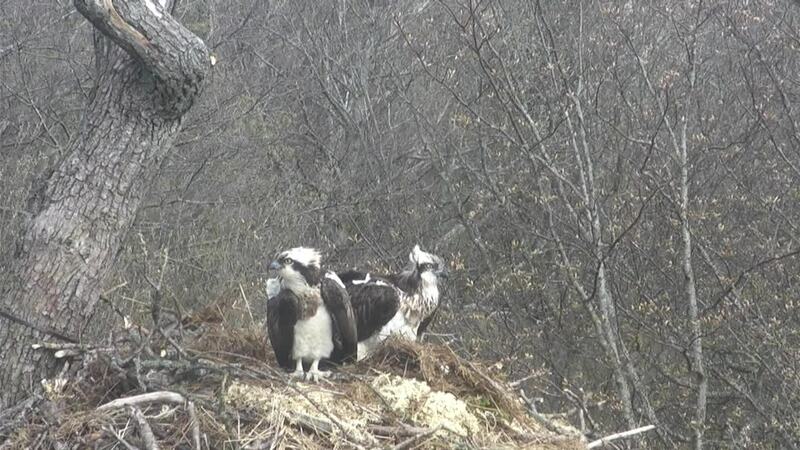 Lake District Osprey Project; The Story of Number 14. Crossed the English Channel via the Isle of Purbeck, Dorset the same day. Down through France and Spain crossed to North Africa. By the 26th he was roosting in Ghana where he spent the next month. He then moved along the coast and crossed to Bioko on 27th November 2013 where he has remained ever since, with the exception of a couple of short excursions to Nigeria. 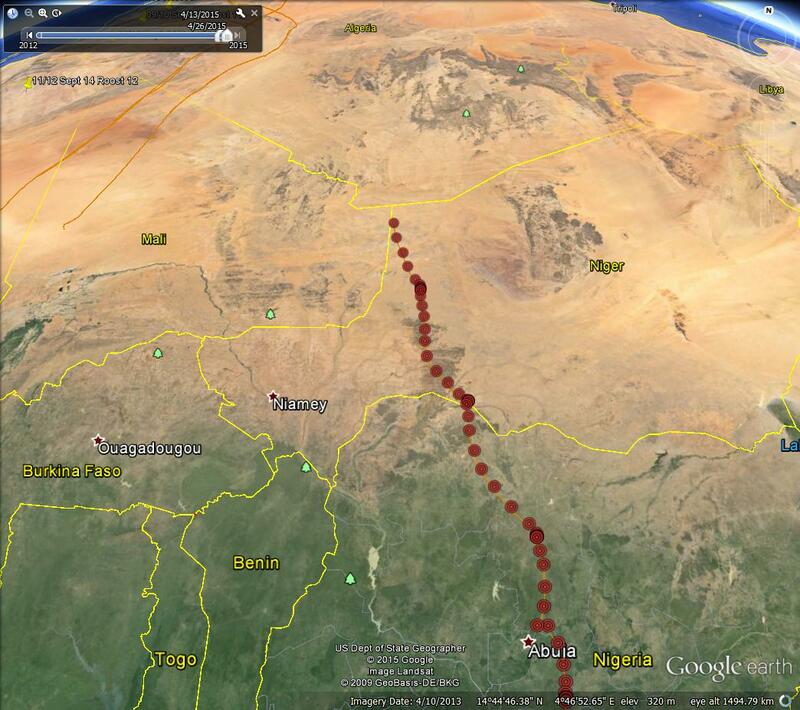 On the 21st April 2015 Number 14 crossed onto mainland Africa once again but this time on a mission. By midday on the 23rd he was passing Abuja, Nigeria, by the evening of 24th he was in Niger roosting near what looks like a river. Saturday the 25th he was roosting in the desert. 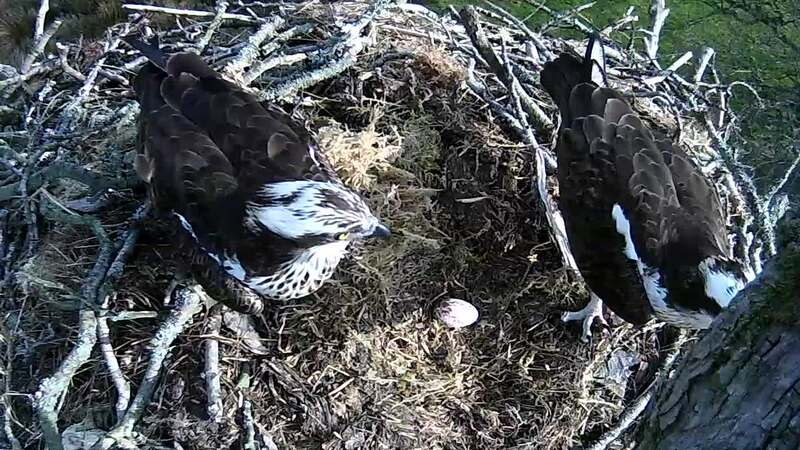 By lunchtime on Sunday 26th – about the time the third egg was seen at Bassenthwaite – Number 14 was just over a thousand miles from Bioko with one thousand two hundred miles to go to the North African coast on a bearing that should take him to Spain. In other words at the last download he was in the middle of the Sahara Desert heading north. Already an amazing bird with an amazing story, what happens next? We all await the next download. 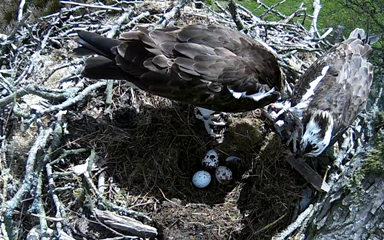 As Egg Number three appears at all of our sites, today at 12.39. Dad celebrates by moving the furniture. 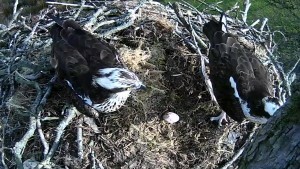 KL laid another egg at 11.00 on Thursday 23rd April. As you can see it is heavily pigmented at one end. In general birds that have exposed nests lay cryptically marked eggs to break up their outline and camouflage them against predators. Hole nesting birds’ eggs are usually white or only slightly spotted. Another function of pigmentation is to re-enforce the calcium shell, making it stronger. This is probably a good thing when you have a bird like Un-ring for a Dad. His stints at incubation are best described as gyroscopic – he cannot sit still. If he is not fiddling with a stick or shredding moss he is getting up, sitting down and turning around. And in between he is head down twirling and spinning and rolling his eggs from one side of the nest cup to the other, like a replay of Alice’s croquet game, with his legs as the hoops. It’s quite un-nerving to watch, although he is very careful to keep his toes curled and his talons well out of the way. It is a fortnight since KL and Unring arrived back at Bassenthwaite. As well as fishing, eating fish and nest building the pair have been mating regularly and successfully – hence this perfect looking egg. Fourteen days is quite a small window of opportunity for a male to pass on his genes but what he lacks in length of time he makes up for in number of times. No-ring, our first male regularly topped 190 attempts in a season. What makes this a bit strange is that the eggs can be fertilised with only one mating so as far as energy goes, multiple attempts are to no purpose. However, looking abroad where ospreys often nest much more closely together than here gives us an explanation of the behaviour. Unattended females may well succumb to the advances of nieghbouring Lotharios so unless a male wants to spend his summer looking after someone else’s chicks it pays him to keep his female closely under his own wing! 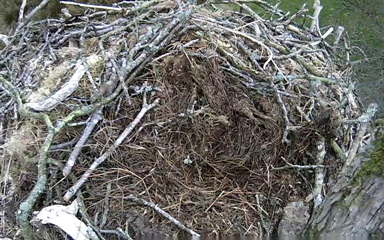 At the start of the day we had two ospreys and an empty nest. At 1500 we had two ospreys, one fish and an empty nest. By 16.30 the nest was no longer empty – one female adult osprey plus an oval speckled object below her – later confirmed to be our first egg for 2015. We now wait for Wednesday and Friday when other eggs may be due – unless of course our pair wish to surprise us once again. It is easy to identify KL because of her white leg ring. Hatched in Scotland in 2009 and photographed twice in Senegal before her first breeding season here two years ago, she has an impressive verifiable history. It is more difficult to positively ID the male bird as her man from last year as he has no leg ring. However, when we compare his head markings with 2014 video it looks to be almost certain that he is her faithful swain. As a clincher their obvious rapport from their moment of meeting should prove to the even a science based stickler that he is the one. Often returning males, even of long established pairs, are a little nervous of approaching their larger ladies at first and will flatten themselves with wings half open in the bottom of the nest, or they will sit with their backs to each other. Ours are already they are sitting side by side, quite relaxed, for long periods of time. 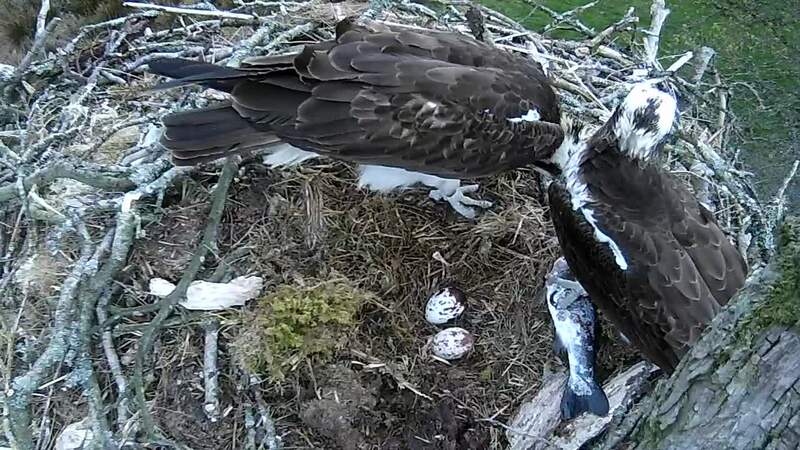 He has been catching fish for her and actively holding them out for her to grab, when he lands on the nest, Their interaction is so slick that can miss the moment if you blink. He has also been bringing up lots of sticks and nest material, covering the layers left from last year, and the moss that we put on. Below Unring on left with brown front, KL with streaky breast on the right. 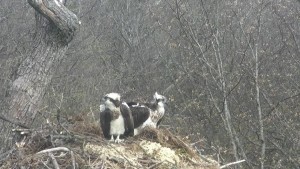 Lake District Osprey Project ; And then there were two! 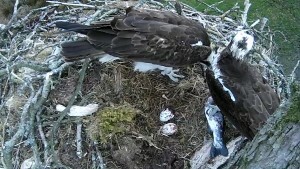 As KL was sat eating her lunch who should turn up on the nest but another Osprey. We think it could well be her partner from last year. 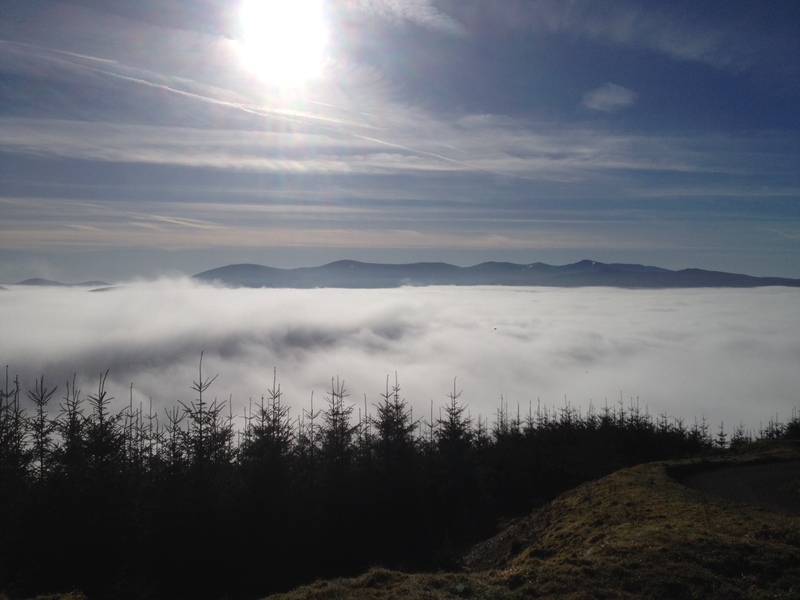 KL was first seen and positively identified this morning at 8.15 from Whinlatter Forest Centre. The new bird first seen from Dodd Wood at 13.35. Judging from the mating attempts that have been seen this afternoon it seems that we could well have a project this year. All this and sunshine as well. Yesterday afternoon an osprey was seen fishing at both North and South ends of the Lake. 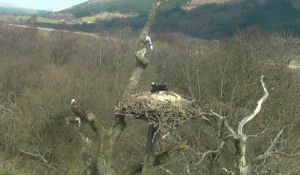 She has been arranging the moss in the nest and has caught a fish in front of the Viewpoint at Dodd. Amazingly, she has returned on exactly the same date as last year! Her mate arrived on April 3rd last year, so there is a good chance it won’t be long before they are re-united. After the storms and snow of last week migrants should be on the move again from Spain and Europe. The first chiff-chaffs have been flying in marking out their territories with their repetitive call. Should our osprey pair arrive today, what will the first sight of the valley be? A bowl of milky mist with a rim of clear cut mountains; a phenomena caused by inversion of temperature. 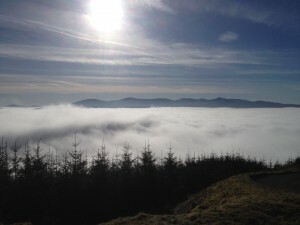 So, for those of us without wings, and depending where on the mountain we are standing:- sunscreen and t-shirts for the tops, trousers and thick socks for the bottoms.